Serena Williams, the most successful female player of the Open era, is pregnant - just 12 weeks after winning a record 23rd Grand Slam singles title. The American, 35, is due to give birth in the autumn, says her representative. The world number two posted a picture on social media app Snapchat, posing in a mirror with the message: "20 weeks", before deleting it. If accurate, that would mean Williams was around eight weeks pregnant while winning in Melbourne. Williams will miss the rest of the season, having not played since the Australian Open, citing a knee injury. Williams, who will return to world number one next week, would be eligible to retain her ranking under the WTA special ranking rule if she is ready to play her first tournament within 12 months of giving birth. Former world number one Victoria Azarenka gave birth to her first child in December and is expected to return to competition at the end of July. The news would suggest that Serena won the Australian Open while roughly eight weeks into her pregnancy. We are very unlikely to see her compete in another Grand Slam before the French Open of 2018. That event will take place four months before her 37th birthday - but do not write off a woman who will return to world number one on Monday. Azarenka is a useful guide. Even though she is eight years younger, the Belarusian returned to serious training in March after giving birth in December and is targeting the WTA event in Stanford at the end of July for her return. US Open Tennis responded to Williams' message by saying: "Serena Williams will have a new pride and joy to hug and call her own soon! Congratulations on the exciting baby announcement!" 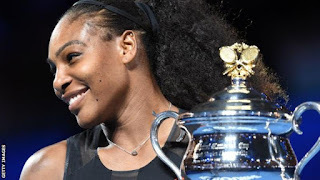 Williams, who announced her engagement to the co-founder of community news and chat site Reddit, Alexis Ohanian, in December, is top of the all-time list of major winners since Grand Slams accepted professional players in 1968. She is second only to Australian Margaret Court on the list of women's all-time Grand Slam singles titles leaders - Court won 24 titles between 1960 and 1973. Court, who won the singles Grand Slam in 1970, gave birth to her first child in March 1972, aged 29, and returned to win three of the four Grand Slam events in 1973. Williams is a five-time Tour finals winner, the last of which came in 2014, and was recently picked as the greatest female tennis player of the Open era by BBC Sport readers.